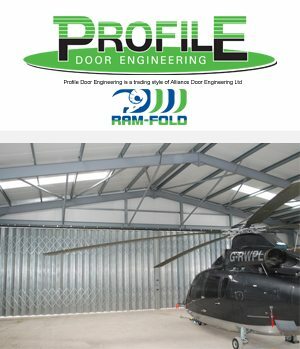 Our Series 80 Folding Shutter Door are a robust product ideally suited to protect commercial, industrial and aircraft hangars with openings up to 30000mm wide x 8000mm high, in addition to providing ease of operation with such large openings with high traffic flow, the doors are designed withstand gusts in excess of 150mph. Each door is made to measure, CE marked, and complies with European directives and gives you peace of mind. Each design has been thoroughly tested and inspected by Exova enabling us to issue Declaration Of Performance. All our Folding Shutter Doors are manufactured in house at our facility in Leigh and are subject to continuous product development, ensuring the products we offer are of the highest quality whilst maintaining ease of installation. Each Folding Shutter Door can be designed manufactured to suit your specific requirements using the latest technology from the three leading Industrial Door Motor suppliers, GFA, Link Controls and Ellard, our dedicated team can give advice and technical support, we can back up an already high quality product with first class service and support. Heavy-duty door ideal for large openings up to 45m wide and 10m high and able to withstand wind gusts of 150mph. The door consists of 230mm ribbed galvanised sections, hinged vertically by a continuous hinged strip. The top track supports the weight of the door and is made from heavy gauge cold rolled steel strip. It is fixed to the lintel with fabricated mild steel brackets where required, and is galvanised or painted depending on the door size and specification. Pickets are made from galvanised rolled steel strip and from the main framework for the door on the inside of the building. The top of each picket is supported from the top track with a hardened steel grease sealed multi ball roller. The bottom of each picket runs within the bottom track and gives the door its strength in wind. 230mm leaves made from cold rolled galvanised steel strip and are ribbed for aesthetic purposes and extra strength. The gauge varies to suit the size of the door. The hinge strip is capped cold rolled galvanised steel channel, which allows the leaves to hinge vertically and move with the picket section when the door is operated. The lattice is a unique shape for extra strength and is formed from heavy gauge cold rolled galvanised steel strip. The lattice is bolted onto the pickets and controls the lateral movement of the door, it also prevents the door from flattening out due to wind pressure. The standard bottom track, which is set in the floor, is manufactured from heavy gauge cold rolled steel strip and runs the full length of the door. The leading edge is for accommodating hasp and staples, locks, handles etc and stiffens up the front of each door. Steel strip is pressed braked to the required size and shape and is fixed to the door to give maximum security. Each door has a bow handle inside and out and is fitted with heavy duty hasp and staple normally fixed inside unless otherwise requested. The door is fitted with a 415v 3ph geared electric motor with a manual disconnection for hand use in emergencies. Each motor unit is fitted with a torque limiter which stops the door at each end of travel and also in an emergency. The starter contains OPEN STOP Close buttons plus a safety thermal cut out switch.